You are a database administrator for a company that has an on-premises Microsoft SQL Server environment and Microsoft Azure SQL Database instances. The environment hosts several customer databases, and each customer uses a dedicated instance. The environments that you manage are shown in the following table. 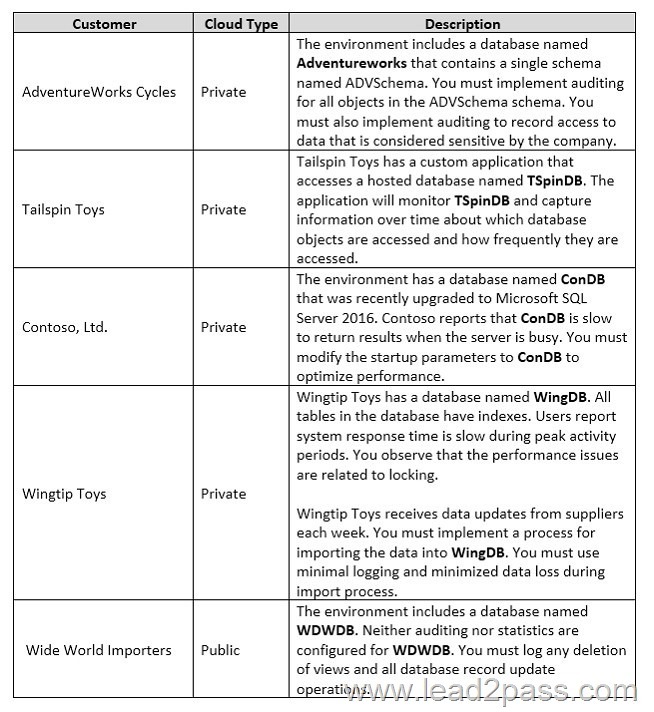 You need to implement a process for importing data into WingDB. 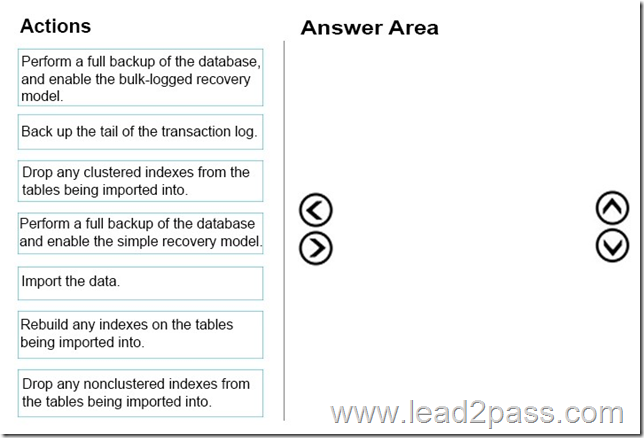 Step 1: Perform a full backup of the database and enable the bulk-logged recovery model. 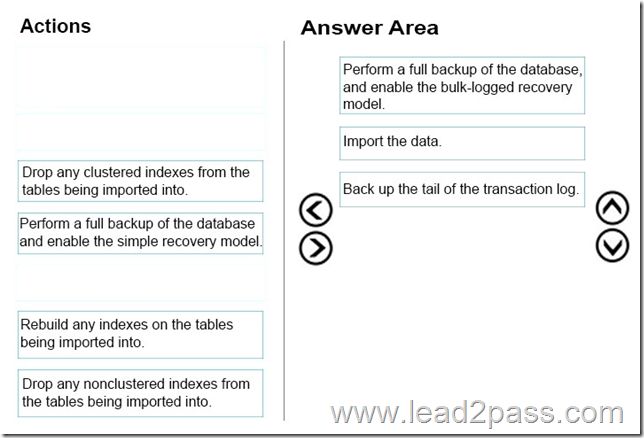 With the Simple recovery model we cannot minimize data loss. Step 3: Backup the tail of the transaction log. For databases that use full and bulk-logged recovery, database backups are necessary but not sufficient. Transaction log backups are also required. Note: Three recovery models exist: simple, full, and bulk-logged. 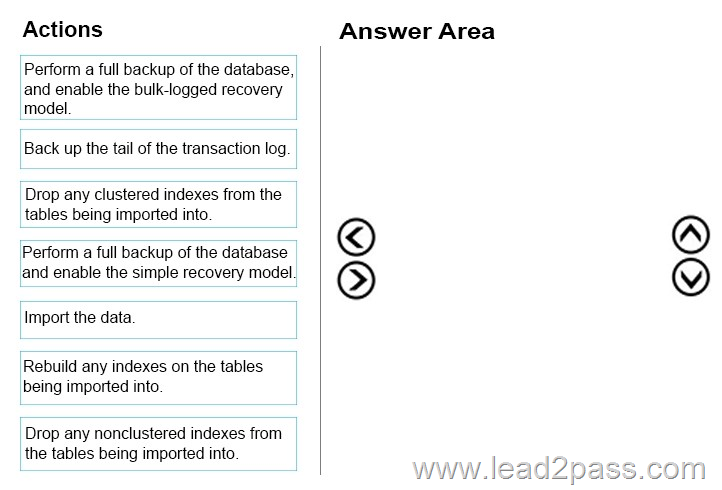 Typically, a database uses the full recovery model or simple recovery model. 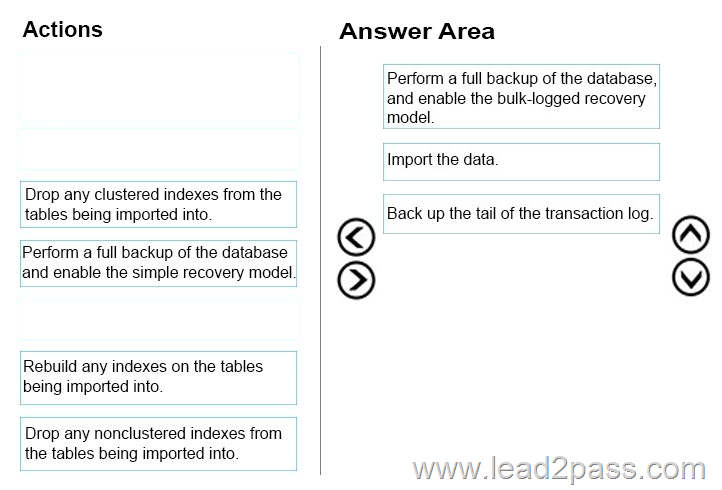 A database can be switched to another recovery model at any time. 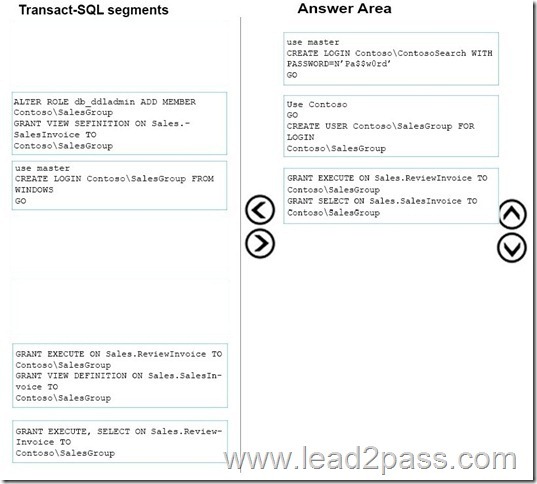 You have a database named salesOrders that includes a table named Table1. Table1 becomes corrupt. You repair the table. 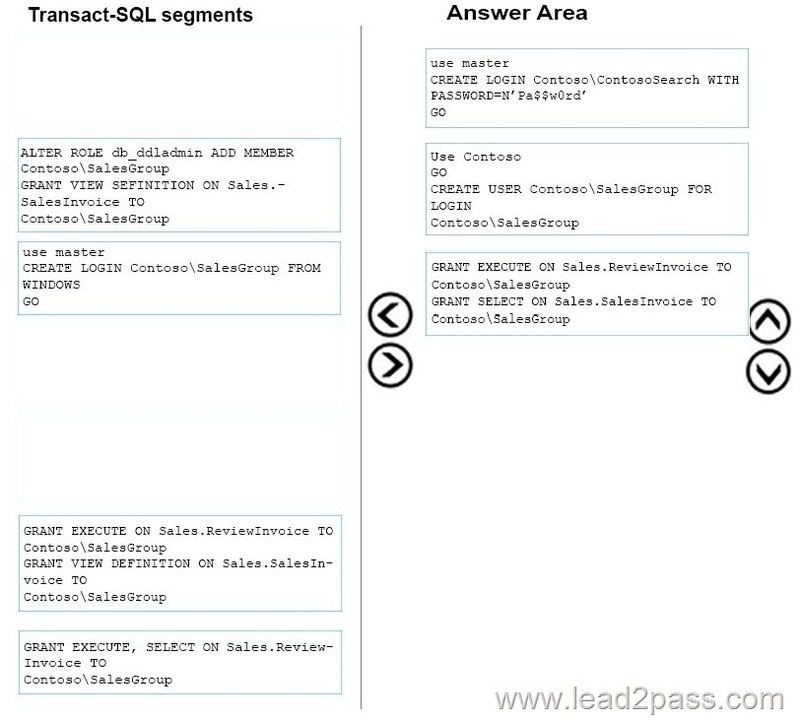 You need to verify that all the data in Table1 complies with the schema. 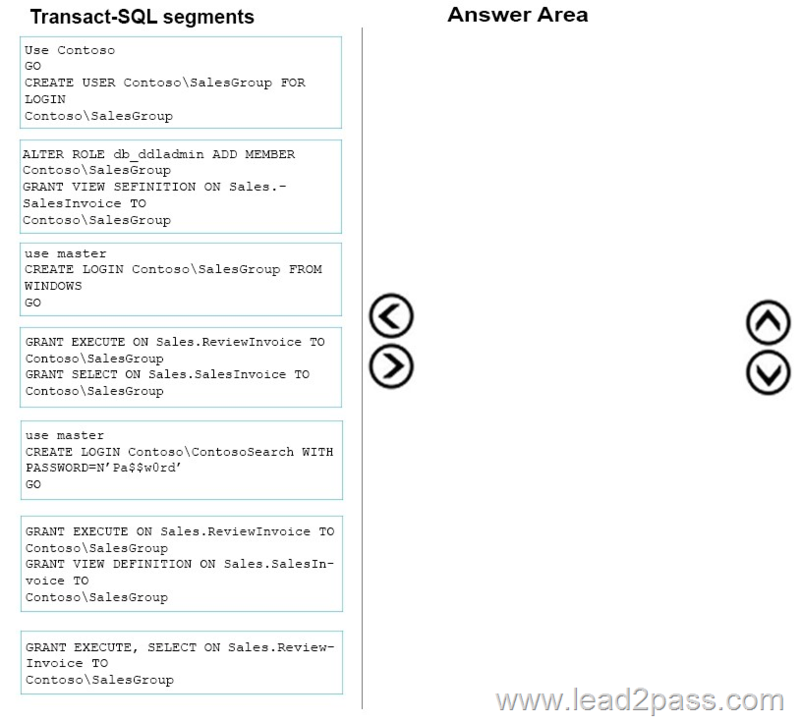 How should you complete the Transact-SQL code statement? 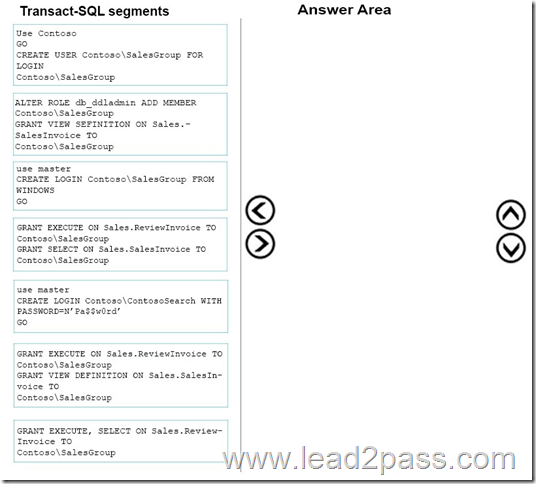 To answer, select the appropriate Transact-SQL code segments in the dialog box in the answer area. DBCC CHECKCONSTRAINTS checks the integrity of a specified constraint or all constraints on a specified table in the current database. 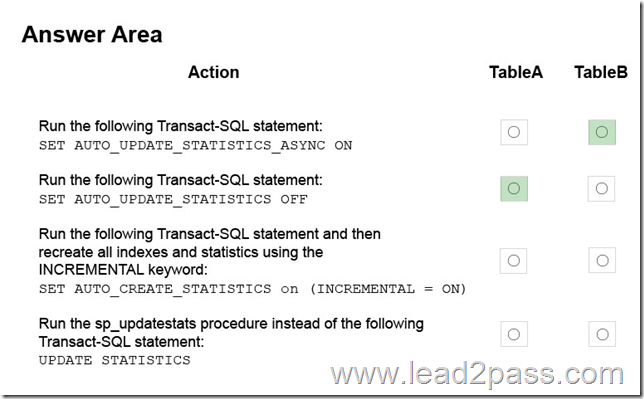 ALL_CONSTRAINTS checks all enabled and disabled constraints on the table if the table name is specified or if all tables are checked;otherwise, checks only the enabled constraint. You deploy a Microsoft SQL Server instance to support a global sales application. The instance includes the following tables: TableA and TableB. TableA is a partitioned table that uses an incrementing integer number for partitioning. The table has millions of rows in each partition. Most changes to the data in TableA affect recently added data. The UPDATE STATISTICS for TableA takes longer to complete than the allotted maintenance window. Thousands of operations are performed against TableB each minute. You observe a large number of Auto Update Statistics events for TableB. You need to address the performance issues with each table. In the table below, identify the action that will resolve the issues for each table. Table A does not change much. There is no need to update the statistics on this table. 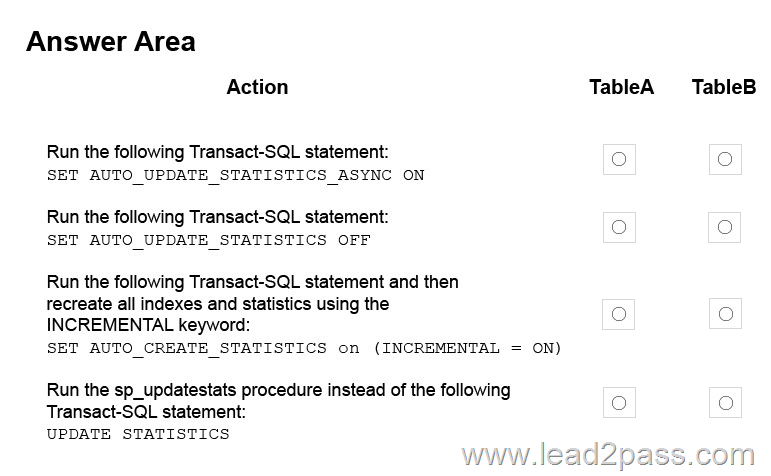 If you enable this option then the Query Optimizer will run the query first and update the outdated statistics afterwards. You administer a Microsoft SQL Server database named Contoso. You have configured Resource Governor with three resource pools. You have assigned the first resource pool a minimum CPU and memory value of 20%. You have assigned the second resource pool a minimum CPU and memory value of 30%. You want to assign maximum CPU and memory values to the third resource pool. What is the maximum CPU and memory value you can assign to this resource pool? You administer a single server that contains a Microsoft SQL Server 2016 default instance on which several production databases have been deployed. You plan to install a new ticketing application that requires the deployment of a database on the server. The SQL login for this application requires sysadmin permissions. You administer a Microsoft SQL Server 2016 failover cluster that contains two nodes named Node A and Node B. You administer a Microsoft SQL Server 2016 default instance.